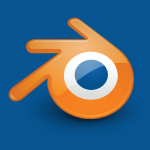 We’re going to have some fun in this Blender Tutorial! We are going to learn how to model 3D shapes in Blender. First I’ll demonstrate how to make a gear using the techniques we’ll use to create more complex models. Then we will make a 3D dog using a reference image. We make 3D models using Extrude, Move, Scale and Loop Cuts. We also use the Boolean Modifier to make cuts in our shapes. Everything I did in this video is available after the video below. If you like videos like this consider donating $1, or simply turn off AdBlock. Either helps me to continue making tutorials for free.